/ Modified aug 22, 2017 12:04 p.m.
What Did the Eclipse Mean to You? Tucsonan Rafael Guillen views the solar eclipse through glasses he purchased at the UA's Flandreau Science Center and Planetarium. 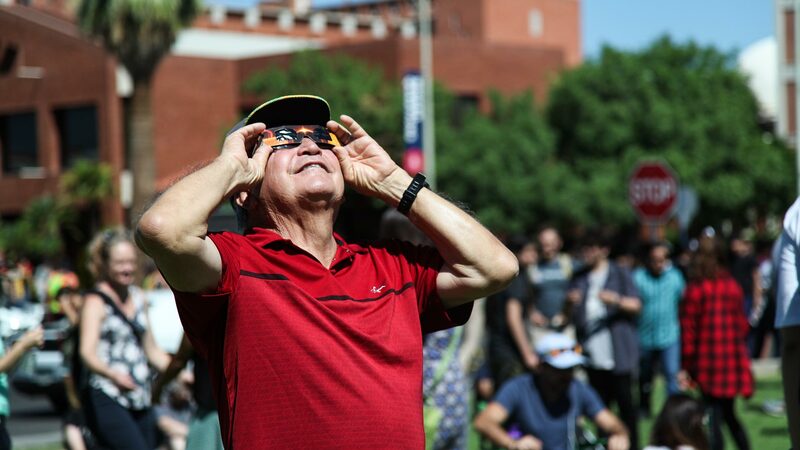 Tucsonans of various walks of life gathered in front of the University of Arizona’s Flandrau Science Center and Planetarium to view the partial solar eclipse Monday. 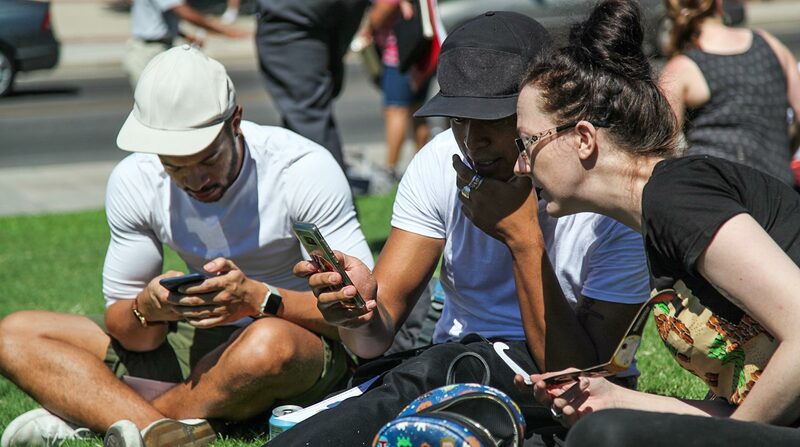 A few locals talked to Arizona Public Media about what the eclipse-viewing experience meant to them. I’m 11 [years old]. It’s pretty cool, I guess. Like, there’s a lot of people just to see the moon going over the sun. VIEW LARGER Mary Dailey and her grandchildren, Michael and Malakai, watch the solar eclipse on the lawn at the Flandrau Science Center. I’m [Michael’s] grandma. I think it’s awesome. I mean, we’re a tiny, tiny part of a huge universe, and I think it’s very cool that people are here. People do fly, you know, guys, all over the place to see them, but we’re really lucky to have one here. So a lot of people seem to know that. In my day job, I am an engineer with the Pima Association of Governments. But right now, I’m here as a hobbyist with my cameras. Before I changed to engineering, I originally wanted to go into astronomy. So here I am, enjoying my hobby. It’s always great to see people who are this interested in science, and events like this. VIEW LARGER Nickael Rupp and Nicole Amy look at a photo of the eclipse Rupp took on his iPhone. I’m a junior here at the UA. I think it’s really amazing that we can all come together just see to see the moon pass over the sun, which happens every single day, but obviously this day is very special. I just met [Nicole Amy], and now we’re friends forever, all because of the moon. I’m a Tucson resident, I’ve been here since ’87. I’ve seen another solar eclipse before, back in ’79. It was in Central America, that’s where I was. That’s where I saw it. And it was a total eclipse then. I’ve never seen a partial like this. So, I’m just curious to see what it looks like, and ask questions here of people. Mainly that.